My small bathroom lacks both a linen closet and a cabinet under the sink, but we still needed a place to store our toiletries. It's the bathroom my daughter uses as well as the bathroom designated for guests. Everyday items should be stored where they're more convenient. So in a tight spot, we added a small cabinet. I purchased this cabinet from Wal-Mart. It was inexpensive, easy to put together and provided the extra storage that we needed. I love the glass doors. A place to tuck away extra towels and toilet paper. A spot to keep jewelry while showering. A few cut flowers are a welcoming touch. I love a nice scented candle in the bathroom. So if you're lacking space, I hope this inspires you to have a more organized bathroom. What a delightful way to start my day with Coffee in hand. Looks fantastic Brandi. I love the texture the baskets add. And, so functional. Great job!! This looks fabulous Brandi, I love the use of the baskets too. Perfect inspiration, my friend! Your styling and photography are top-notch, too! I love this nice, clean look! I LOVE your bathroom!! I, too, have a long, very narrow bathroom with a linen closet on one end and shower/tub on the other. I'd love to take the doors off the cabinet, which is long and add glass doors to open up the space. I'd also use baskets as you have. You've inspired me to do some reno in the bathroom!! Oh, and may I ask where you found the pretty, scalloped edge rug? It looks fantastic! Very spa-like. Fantastic job as usual Brandi. It looks perfect. Your pretty pics look like a magazine spread! Gorgeous! I spy your candle snuffer too. :) You've done a great job organizing and decorating! wonderful taste. i love the way you design. i love neutral colors, too. great work brandi. cheers!! By guests you mean me right? This is adorable and the colors go together perfectly and it's so relaxing!!! The baskets are the perfect touch to the all white. Well done. gorgeous!! I absolutely love the special touches that you added to this room. You have definitely got me thinking of ways to spruce up my guest bathrooms! So Pretty... love it and the white just screams serenity. What a great idea. I love the baskets for storage. You have a beautiful bathroom. It looks neat and fresh; that was a great idea without having to spend much. I love the use of baskets to 'hold' the toiletries. That's a beautiful bathroom and linen closet Brandi!! Love it! So light and pretty. Ross has the best stuff for low pricing, I love those baskets. Omg how sweet is this bathroom!! I love how you took a basic cabinet and made it really special with such thoughtful styling. Its so pretty. I just love it. 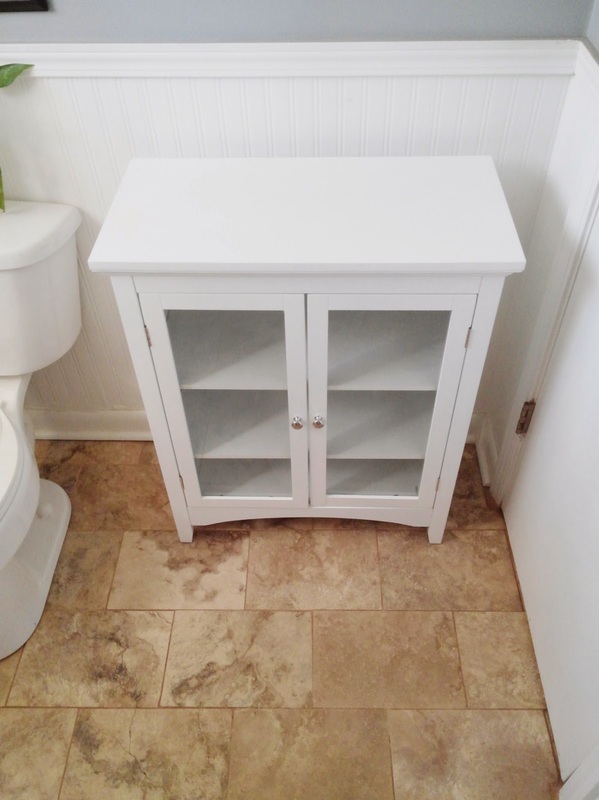 Hi Brandi, love your bathroom and the addition of the cabinet is perfect. It looks spa like and very organized. Two things I just love in any room. You created a wonderful space for useful storage. OMG Brandi I love you bathroom it looks like something straight out of Better Homes and Garden, I kid you not! It is so clean and crisp and you took beautiful pictures!! FYI I nominated you for the Sunshine Blogger award, check out my post on my page! A little cabinet can go a LONG way when it comes to keeping it tight. Great job! SO beautiful! Love how the baskets coordinate and keep everything neat. :) Even your candle is so pretty and coordinated. Brandi, your bathroom is beautiful. I love clean white bathrooms; they look so fresh and inviting. You took that Walmart cabinet and made it look like a million bucks. Oh, this post really hit home for me, as I am having a lot of family over this weekend. I can sure use some ideas. Your bathroom is gorgeous, and I love all the white, it's so pretty. Cabinets really do make a difference in the bathroom, don't they? I really like the baskets and how you used them for organizing. It all looks so nice. Gorgeous! I love all of the white.. Maybe I should switch up! This is such a beautiful bathroom, wow! I love how clean and classic it is! Gives me inspiration for my future bathroom! Now that's the kind of bathroom that makes you want to go take a bath! Loving the crisp, fresh look. It's like a spa day right at home. I just love that you have everything white. Looks so lush and clean. Beautiful.